Twenty-five (25) years ago on June 18, 1981, the representatives of seven (7) states of the Windward and Leeward Islands, met in Basseterre, St. Kitts and Nevis and signed the Treaty of Basseterre which created the Organisation of Eastern Caribbean States, (OECS). Three years later, in November of 1984, the British Virgin Islands became an Associate Member and in May 1995, Anguilla followed suit. The OECS evolved from the West Indies Associated States (WISA) and the East Caribbean Common Market (ECCM). In 1966 the WISA Council of Ministers was formed as an informal association of the Governments of the Windward and Leeward Islands. 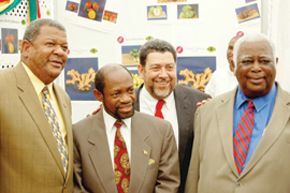 Several commentators have credited the political leadership in the islands at the turn of the 1980’s with great foresight and courage, since it was a time when the integration landscape in the Caribbean had chalked up several failed attempts such as the attempts at West Indies Federation and that of linking Barbados with the Windward and Leeward Islands. In 1967 WISA Council of Ministers established the High Commission to Ottawa, later renamed the OECS High Commission to Ottawa. This Commission is responsible for promoting and protecting Member States’ interests in Canada through diplomatic, political, consular and cultural activities. Her Excellency Ms. Lorraine Williams is presently the High Commissioner. Also established in 1967, is one of the pillars of OECS integration, the Eastern Caribbean Supreme Court. It is the superior Court of Record for 9 member states, six of which are independent namely, Antigua and Barbuda, St. Kitts and Nevis, Dominica, St. Lucia, St. Vincent and the Grenadines and Grenada; and three British Overseas Dependencies namely, Anguilla, British Virgin Islands and Montserrat. The Court is currently headed by Acting Chief Justice, Mr. Brian Alleyne. In June 1984, the OECS Aeradio was established and is responsible for maintaining telecommunications and navigational aids in various islands. This period also saw the establishment of the OECS Legal Unit which provides legal advice, legal drafting skills and assists in the reform and harmonization of the laws of member states. The OECS Sports Desk, which has been promoting youth and sports development and physical education in member states through competitions and training opportunities, was established in September of that same year. Mr. David Peterkin is the OECS Sports Coordinator. The Directorate of Civil Aviation (DCA), was created in 1950 for the Windward and Leeward Islands, in 2004, it became an autonomous body and was renamed the Eastern Caribbean Civil Aviation Authority (ECCA). Like its predecessor, the DCA, it continues to promote safe, orderly and efficient air transportation and regulate civil aviation activities within OECS member states. The ECCA is headed by Director-General, Mr. Herald Wilson, who is currently seconded to the Montreal- based International Civil Aviation Organisation (ICAO). Mr. Rosemond James is acting in his absence. As the OECS continued to develop and expand to meet the needs of Member States, the Eastern Caribbean Drug Service (ECDS) was established in 1985 and subsequently renamed the OECS Pharmaceutical Procurement Service (PPS). It provides a centralized tendering service for the bulk purchasing of pharmaceuticals to reduce costs for public hospitals and health centers in Member States. By pooling resources, OECS nationals pay up to 40% less for some medicines. Mr. Francis Burnett is the Managing Director of the PPS. â¢ The OECS Environment and Sustainable Development Unit (ESDU), formerly the Natural Resources Management Unit, (NRMU), was created in 1988 and provides technical assistance for natural resources management in the region. The ESDU is headed by Mr. Keith Nichols. â¢ The OECS Export Development Unit (OECS EDU) supports businesses in the OECS as they prepare for the regional and international export markets. EDU uses training seminars and direct interventions in wide ranging businesses across the sub-region. The Unit, which was formerly called the Eastern Caribbean States Export Development Agency (ECSEDA) and later the Export Development Agricultural Diversification Unit (EDADU), is based in Dominica and is headed by Mr. Colin Bully. â¢ The OECS Education Reform Unit (OERU) was set up with a mandate to reform education in OECS member states, and to improve access to education at all levels. â¢ The OECS Brussels Embassy was opened in December 1993 as the key instrument in OECS relations with the European Union (EU), including the struggle to protect the banana and sugar industries. It serves Dominica, St. Kitts and Nevis, St. Lucia and St. Vincent and the Grenadines, and also represents the interests of the British Virgin Islands and informally provides information to the other United Kingdom Overseas Territories – Montserrat, Anguilla and the Turks and Caicos Islands. â¢ The OECS Telecommunications Reform Unit was created in 1998 to promote Telecommunications reform, open entry, market liberalization and competition in participating states. In June 2002 the Eastern Caribbean Telecommunications Authority (ECTEL) was established as the regional regulatory body for the liberalized telecommunications sector. â¢ The OECS Trade Policy Project was launched in 2000, and has been working to strengthen the capacity of Member States to fully participate and compete in the global economy through the provision of technical assistance, particularly to officials in the Ministries of Trade. â¢ OECS Environment Ministers signed The St. Georges Declaration on Principles for Environmental Sustainability in the OECS in 2001, which provides the guiding principles for environmental conservation in Member States. â¢ In 2000, The OECS Social Development Unit (SDU) was established and has been working on social policy issues impacting on development in Member States. The Unit published the first OECS Human Development Report in 2002.
â¢ The OECS NewsLink was launched in 2002 as a daily 15 minute regional radio news programme which keeps the OECS and other neighbouring countries informed on current developments in the islands. â¢ The OECS Development Charter and Strategy was approved by Member States in 2002, to guide the development process in the OECS. â¢ The OECS and Puerto Rico signed a Memorandum of Understanding in 2004 to facilitate collaboration in economic and cultural matters. â¢ The OECS Protected Areas Associated Livelihoods (OPAAL) Project was established in December 2004 to help the OECS promote sustainable livelihood while maintaining the protected biodiversity in Protected Areas. â¢ The OECS Geneva Office was established in June 2005 to strengthen the Member States capacity to deal with the process of globalisation and liberalization and the dismantling of preferential trade regimes. â¢ The OECS HIV AIDS Project Unit was established in June 2005, after the signing of an agreement in January 2005 between the OECS Secretariat and the Global Fund, under which the Secretariat, as Principal Recipient, oversees the disbursement of funds for the care and treatment of persons affected by HIV AIDS in the OECS. â¢ The OECS Business Forum was launched in November 2005. It comprises representatives of the OECS Business sector in a forum to provide advice to the OECS Authority and Secretariat on partnership issues. â¢ The OECS Marine Trades Forum was established in December 2005 to facilitate discussion at the OECS level on the continuing development of the yachting sector. â¢ The OECS Institutional Strengthening Project (ISP) was started towards the end of 2005. Its aim is to strengthen the administrative and functional operations of the OECS to help it function in a manner in keeping with the changing times. â¢ The OECS/Commonwealth Secretariat Hub and Spokes project was set up in 2006 to assist Member States in strengthening trade statistics and other matters. This week, coinciding with the 25th Anniversary of the OECS, the 43rd Meeting of the OECS Authority will be held from the 22-23 June, 2006. This country will be represented by Dr. Ralph Gonsalves, Prime Minister and outgoing Chairman of the OECS. This week will also mark the historic hoisting of the first ever OECS flag and the unveiling of a new OECS Economic Union Treaty both of which will be witnessed by the OECS heads of government.